Adda52.com recently inducted Nikita Luther will be joining as a member of Adda52 Pro Live. Along with other team members – Kunal Patni, Amit Jain and Tarun Goyal, Nikita will now represent India as an Adda52 Live Pro in online and land-based tournaments around the world. 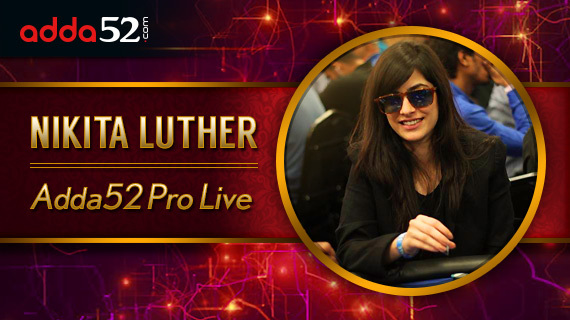 Playing poker for the last 6 years, Nikita is one of the leading female poker players of India. She has final tabled 4 major tournaments which include a runner-up finish in the 5k warm-up event in the August edition of Deltin Poker Tour held in Goa. She has also claimed a trophy in 5k Ladies Finale Event at the India Poker Championship 2015 in Goa and aspires to win a WSOP bracelet someday. For our readers who don’t know much about you, please tell us how you got into playing poker? I started playing poker in college. Since childhood, I was the odd one out with my favourite subject being Math. Poker is a game of skill and can be beaten if you understand the strategy, odds and probabilities behind it; this was enough for me to get hooked on the game from the get go. Now you’re part of a team, and you’re also one of the few if not only women poker players from India. What’s it like being the only woman player on most tables? The men dominated poker industry doesn’t intimidate me in fact its the men who feel intimidated and often get thrown off their game around a woman. What is the best thing about being a member of Team Adda52 Live Pro? Its an absolute honour to be a member of Team Adda52. It’s poker’s biggest platform in the country and I can’t wait to start my term with them. I follow a tight-aggressive playing style. What do you prefer more- cash games or tournaments? I prefer tournaments over cash games. That’s the “sportier” side of poker with trophies, rails, leaderboard rankings, glory and all that exciting stuff. How do you spend your tournament winnings? I believe in spending money on experiences rather than material possessions and I hope to spend any amount I win on exploring, travelling, good food, fulfilling experiences with family and charity. Who is your Poker role model? Do you follow any poker players from whom you have learned the game? I’m a huge fan of Phil Galfond. He’s a wizard. His sincerity, humbleness and academic approach towards poker is more of what this industry needs. Fedor Holz is an absolute beast too! He’s on the run of a lifetime, it’s hard not to want to be him. Besides I’ve sat through strategy and training videos created by Fedor, the way he thinks about the game is really amazing. My poker inspirations are Venessa Selbst and Daniel Negreanu. What is your favorite story from history of poker? The Jack Straus story which gave birth to the famous poker phrase “a chip and a chair”! JTs is one of my favourite hands in Poker but having said that I would rather be holding AA at any given point in the game! Any other interests, apart from poker? What would you like to advise new players who are planning to take up poker as a career? Like any other sport, you get better at Poker with practice and constantly discussing hands and strategy with other pros and accomplished players. So, train yourself while moving up the ladder. What is your poker ambition? My aim is to win a few big international titles. Like other poker pros, my dream ambition is to win a WSOP bracelet someday. Apart from that I passionately aspire to remove the taboo and ignorance associated with poker in India.